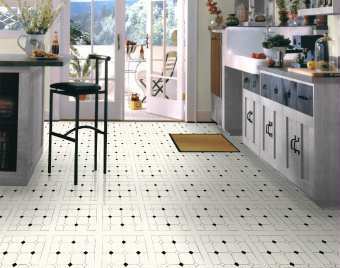 Resilient tile floors are durable, care-free, and beautifully designed. The new generation of resilient tile flooring being manufactured today is an answer to the numerous decorating challenges facing consumers. Resilient tile floors are softer than clay tile or wood, and more stain resistant than carpet. The fact that it is a more 'cushioned' flooring will help eliminate any fatigue factors resulting from walking or standing for long periods of time. Resilient tile flooring is an especially good choice in heavy-traffic areas and rooms prone to spills, although aesthetically, resilient tile floors complement any floor in the home. Technology has enhanced the many attractive features of resilient tile. With modern printing, embossing, and finishing processes, they not only wear longer, but also are more appealing in color and pattern. Many of the new patterns and designs have effectively captured the natural characteristics of natural materials such as brick, stone, clay tile, intricate wood parquet, and even hand-painted tile. This versatility allows you to customize the flooring to the ambience you want to create. For example, you could formalize the dining room floor with an elegant sweep of creamy veined white vinyl that looks like actual marfil marble. Vinyl flooring is available in wide rolls or in tile form. Although sheet vinyl is more expensive than tiles and can cost up to twice as much for a comparable grade, it offers the advantage of fewer seams. In many cases, sheet vinyl can be installed without any seams to catch dirt or to come unglued, an especially desirable feature in rooms that see splashes and spills. Adhesive-backed tiles, in 9 to 12 inch squares, are easy for a do-it-yourselfer to install and provide decorative convenience and flexibility. For more information on this and other vinyl flooring products... FloorBiz is your starting point to all the important resilient tile flooring sites on the internet.